Best practices for building resumes, cover letters, network systems, interview techniques, etc. All are invited to our weekly Monday night meetings, where you will hear from guest speakers, receive invaluable resources to your job search, and be able to network and connect with people on the same journey as you. Each week, we post a Job Board that compiles information, leads, hiring events, and job postings from several different sources. Workshops are provided as a crash course to address the basic requirements of a job search. Accountability Groups provide an opportunity for groups of 6-8 people to meet, get to know one another and help each other along in the journey to re-employment. You are invited to join us every Wednesday night to learn about LinkedIn and how it can be a valuable tool in your job search. Discover all the resources provided through Passport to Employment in one easy place! 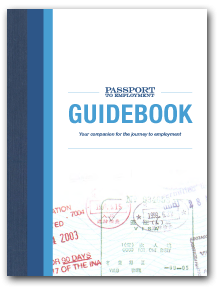 The Guidebook compiles an extensive library of tips, references, examples, and other information used in the Passport to Employment program. Through one seamless document, walk through the job search process stage-by-stage with helpful resources at your fingertips.